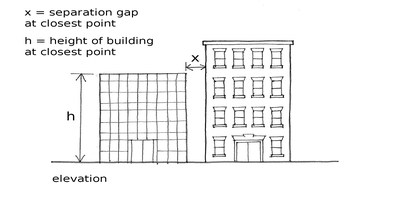 The position of a building in relation to other neighbouring buildings, in terms of the number of adjoining buildings and their location relative to the building under consideration. Adjoining is defined in this table as spaced apart a distance less than 4% of the height of the lower building. If x is less than 4% of h, the buildings are considered to be adjacent.